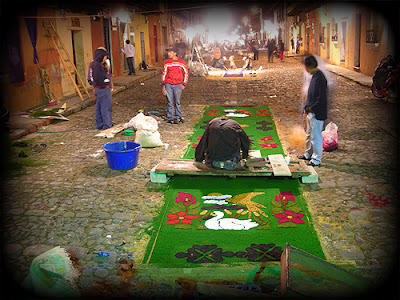 In addition to the artistry of the floats (andas) is the incredible Carpets or Alfombras. Aside from any of our personal thoughts on other details of this event, Nancy and I both were taken back at the community of preparing the alfombras. As we had stated earlier we did the 3am morning experience. While I am not sure, I think we were the only ones that had gone to sleep. 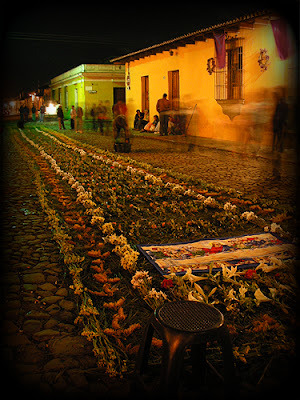 This photograph is one of the many streets (calles) that were full with the bustle of the activities of Semanta Santa. There is a strong sense of community in the festivity of life together. Much more so than even the purpose for which these carpets were being prepared. 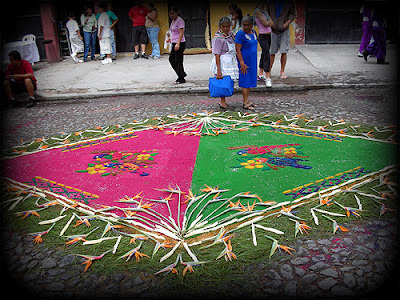 There are two type of carpets (alfombras) made during Semana Santa. The carpets along the processional route are made by residents along the route who invite friends and family to assist them. 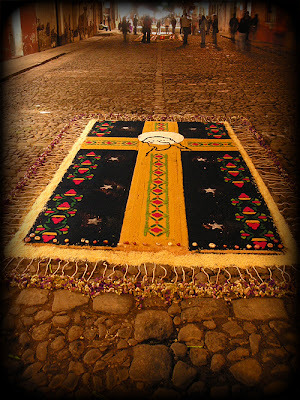 The carpets in the churches are made for the holy vigils (velaciones) and are made by the brotherhoods (hermandades). Velaciones are held in the churches that have religious activities during the holiday. 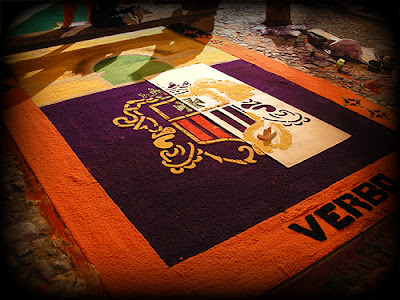 These carpets are made by members of the brotherhood responsible for the sculpture. 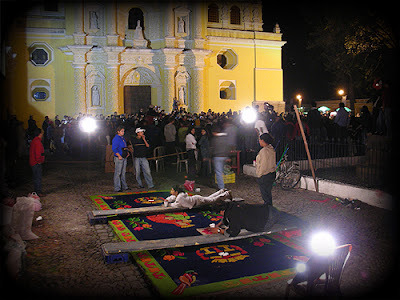 The carpets are made in front of the religious figure on display and are surrounded by fruits, vegetables and candles brought as offerings to the church the day before. 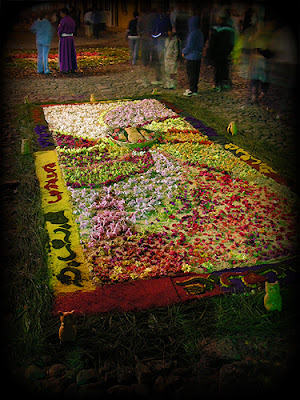 The carpets along the processional route are made during the 24 hours prior to the procession. 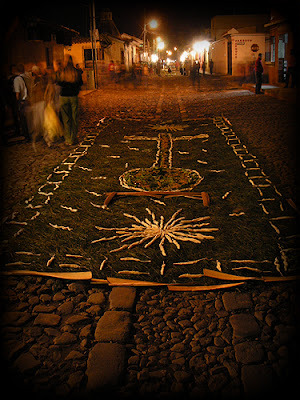 If more than one procession goes down a street a new carpet is made for each procession. Carpets express both religious as well as contemporary messages in the designs. Preparations for the carpets begin weeks, sometimes months, ahead. Sand or sawdust is generally used to level the cobblestone roadway. Sawdust is then collected and dyed in different colors. Favorite colors are purple, green, blue, red, yellow and black. 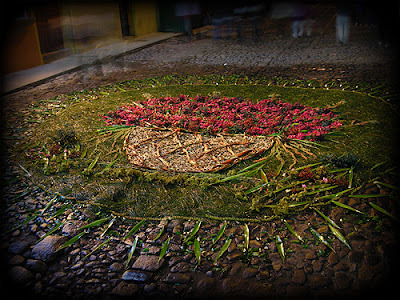 Flowers such as bougainvillea, chrysanthemums, carnations, roses and other native plants and pine needles are also used. 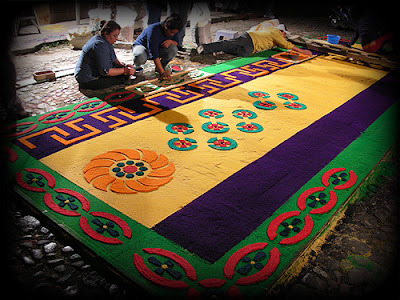 Carpets are started the day before the procession and the construction is timed so that the carpets are finished just before the carriers of the float arrive so that carpet looks its best. The carriers of the main float are the first ones allowed to walk over the carpet. They are followed the rest of the procession.